Telerik Watch: Q2 2008 now live! The big release is finally here! Our teams have worked extremely hard to bring you another (mostly on-time) release packed with new features and controls, and now it's time for you to download it. 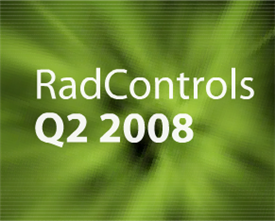 Q2 2008 is a unique release because it welcomes two new product lines to the RadControls family- RadControls for WPF and RadControls for Silverlight- and we're very excited to be the first major UI component vendor to deliver UI component suites for all major Microsoft UI platforms- ASP.NET, WinForms, Silverlight, and WPF. It's just another step in our quest to become your one-stop-shop provider for all of your UI component and .NET tools. Not much else needs to said. You can catch my earlier coverage of the Q2 release for some perspective of what's new today. The only new detail to mention: the Default2006 skin in the RadControls for ASP.NET AJAX will not be retired in Q2. Many of you asked us to save it from being removed from the built-in skins and we listened. Otherwise, enjoy the release notes and the new bits! Q2 release was quick, which is good for us. @Gregory- Q3 will be a little bit longer, giving us more time to do some bigger things. We currently expect Q3 to ship sometime between late October and mid November. We'll be providing more details soon. 'Til then, enjoy Q2! Congratulations! to all our Telerik Friends in the USA and Europe!